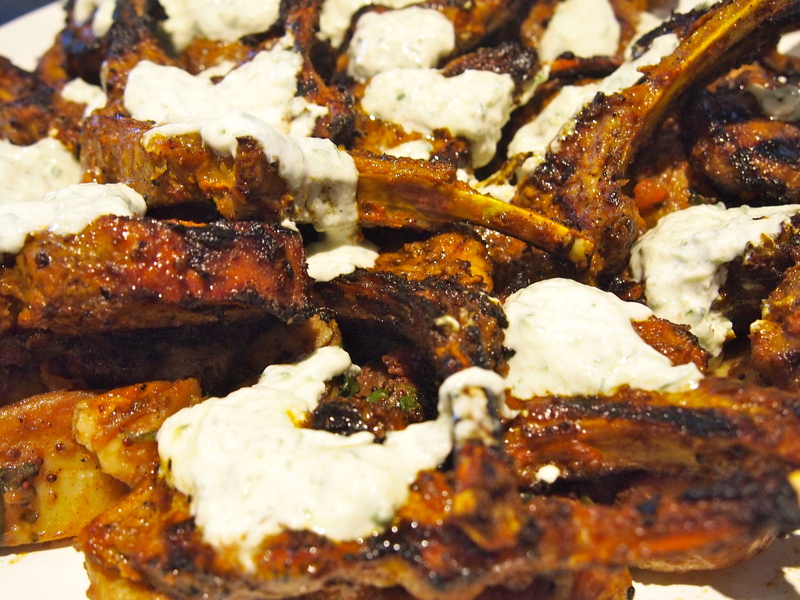 Next time you feel like firing up the barbecue and want a break from the same old steak dinner I can highly recommend these tandoori lamb cutlets. I needed to provide a barbecue meat and salad dish to take along to a family gathering and I was trying to think of something a little different. I knew my sister was making some Asian style grilled chicken (a great recipe that I’ll post shortly) and I thought something in keeping with those Asian flavours would work well. My favourite Indian restaurant in Sydney serves fantastic tandoori lamb cutlets so I thought I’d try and recreate them and serve them with Bombay potatoes and some raita. Bombay potatoes are a lovely Indian side dish normally made with par boiled and cubed potatoes and mustard seeds which are pan fried with some other spices until crispy. 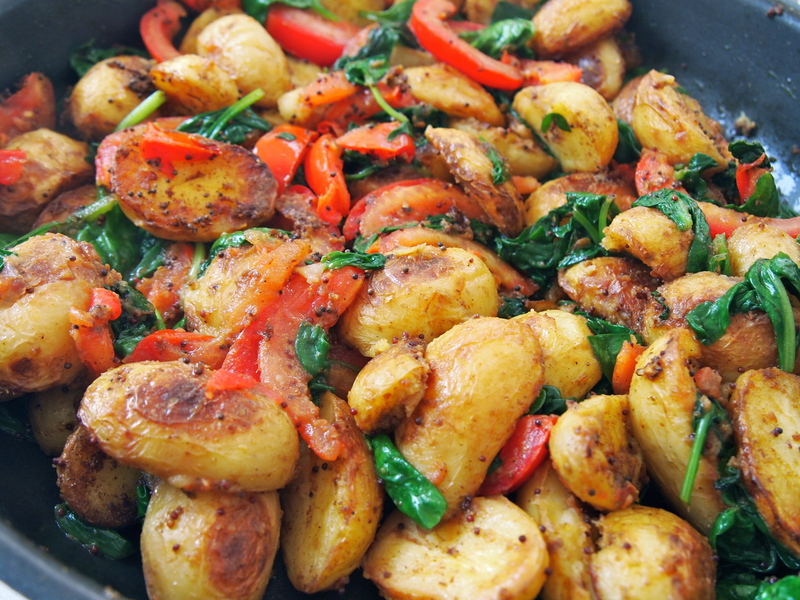 I went down a slightly different, and I think easier, route by using baby potatoes and roasting them in the oven before introducing them to the spices in the frypan. The potatoes were crispier and didn’t become mushy, which can tend to happen if cooked in a frypan. The lamb cutlets were excellent and can easily be served on their own without the potatoes and the potatoes can also be served as an accompaniment for an Indian dinner or as a side dish to just about anything. I served it all one one big platter with the lamb cutlets placed over the potatoes and the chutney infused raita spooned over the cutlets – delicious! To make the lamb cutlets place all the ingredients except the lamb into a large bowl and mix until well combined. Add the lamb cutlets and stir them into the marinade making sure each cutlet is well coated. 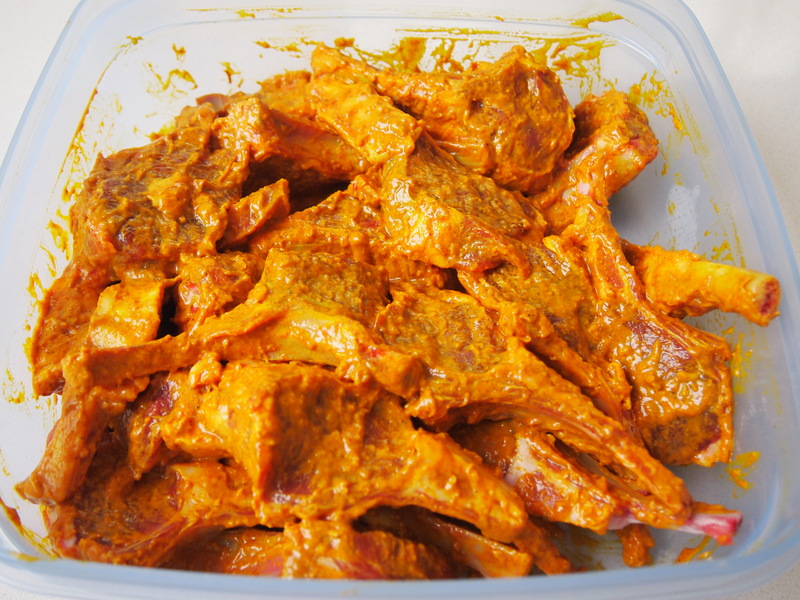 Leave to marinade over night if possible but even an hour or two will suffice. When ready to eat, heat the barbecue and cook the lamb cutlets for a couple of minutes on each side for medium, or longer if you prefer them well done. 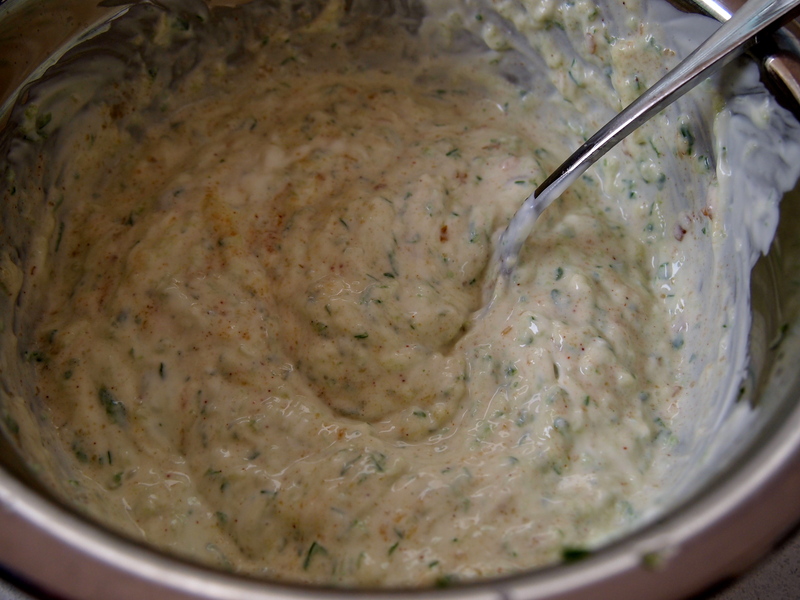 To make the raita place all the ingredients into a bowl and mix to combine. To make the bombay potatoes heat the oven to 200C. 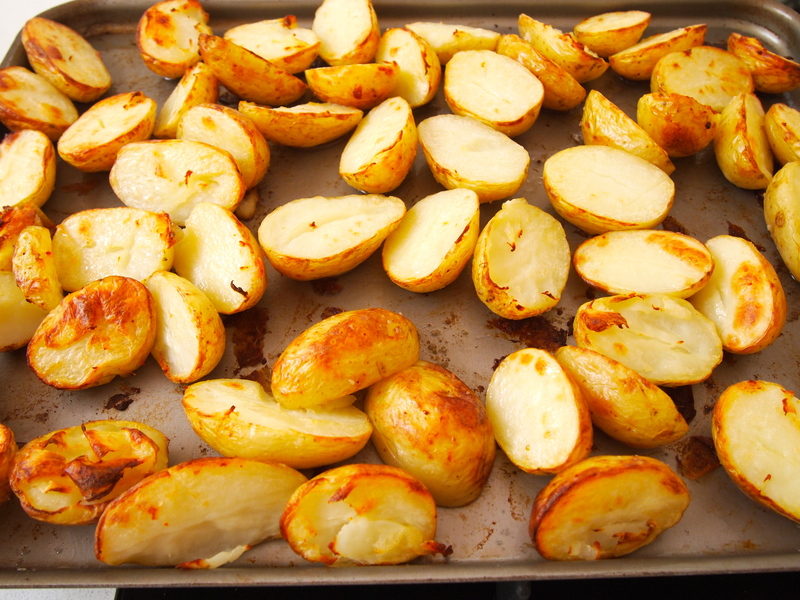 Place the potatoes on a baking tray and season with salt. Add 2-3 tablespoons of the oil to the potatoes and stir to coat well. Place in the hot oven and roast for 45-50 minutes until crisp and golden. Half way through the cooking time turn the potatoes over. 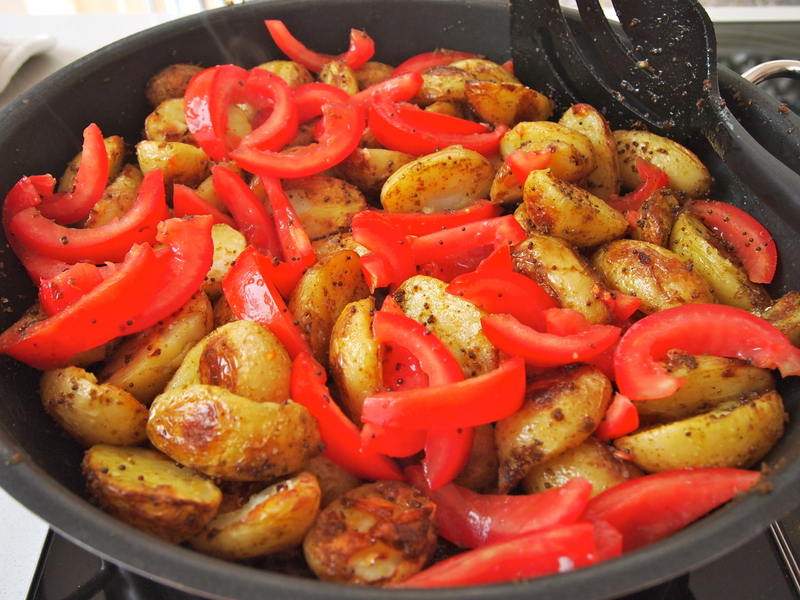 When the potatoes are almost ready place a large frypan over a medium flame and add the rest of the vegetable oil. Add the mustard seeds and cook for 1 minute. 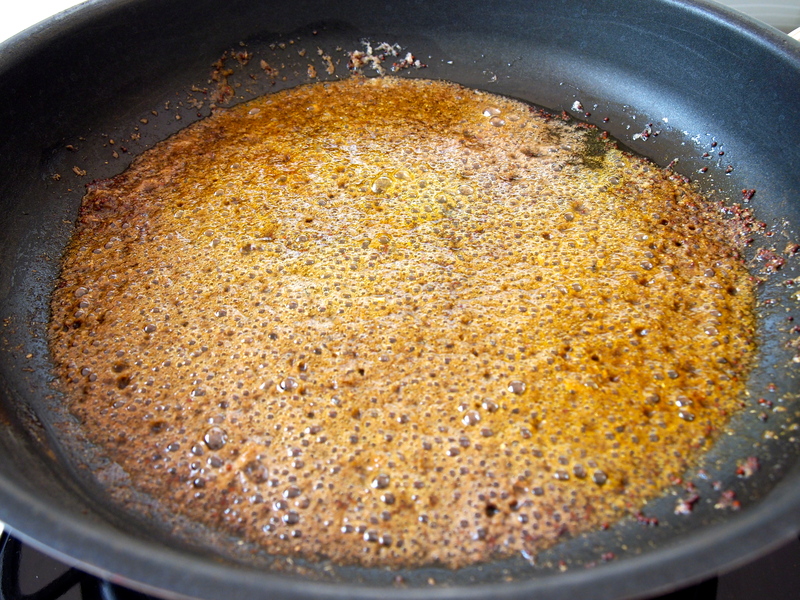 Add the rest of the spices and ginger and cook for a few more minutes, adding more oil if the pan looks too dry. When the potatoes are ready add them to the frypan and stir to coat them in the spices. Add the tomatoes and spinach and cook until the spinach has wilted. Taste for seasoning and add more salt if necessary. To serve place the Bombay potatoes onto a large platter. Place the cutlets over the potatoes and top each cutlet with a little raita and serve the rest at the table. Hi Simon, Thanks for your comment and I hope you get the chance to try it out – lamb, potatoes and Indian spices are a match made in heaven!